A lunch meeting the other day was scheduled at a lovely little restaurant along Lakeshore Drive in Kelowna. I was a couple minutes late, and thankful to nail a parking spot almost directly across the street. There is a marked, pedestrian crosswalk a block away, but not one at the intersection directly beside the restaurant. In my hurry, I chose not to take the extra time to use the marked crosswalk. Instead, I stood there at the intersection, traffic passing me by, the drivers completely ignoring me. Finally, a natural break in the traffic gave me the opportunity to dart across. I don’t feel that I put myself in any danger. I was 100% alert to the traffic, and my “darting” across was about being late. I did not narrowly miss being mowed down. Had I taken the time to go to the marked crosswalk, though, I could have stepped out in as leisurely and entitled a manner as I wished, with the full confidence of having the “right of way”. Traffic would have had to respect the law and stop. My “lunch date” was already at the restaurant, seated at the street side window. She saw my antics. We discussed the irony of me of all people, a personal injury lawyer and road safety advocate, seemingly breaking the rules of the road and thereby putting my life in danger. This isn’t the first time I’ve owned up to bad behaviour in this column. In one of my most popular columns, back in April, 2010 (Columnist not practising what he preaches), I owned up to being nailed at the then-frequent speed trap on the west side of the William Bennett Bridge. The “bad behaviour” I owned up to was not so much the speeding itself, by the way. The bad behaviour I identified and owned up to was the daydreaming that distracted me from the task at hand, which includes regulating my speed. My jaywalking behaviour was different. This time, I thought I was in the wrong when I was really in the right! That’s another piece of irony: A personal injury lawyer getting the law wrong! It’s a common misunderstanding that “lawyers know the law”. There’s a lot of law out there! We learn the bits and pieces that are relevant to the particular fact patterns we come across. I had just never come across this particular fact pattern. Paraphrasing section 179 (1) of the Motor Vehicle Act, a vehicle must yield the right of way to a pedestrian when the pedestrian is crossing the street in a crosswalk. But the crosswalk was a block away! Yes, the “marked” crosswalk was a block away. I had not realized that the word “crosswalk” is defined in section 119 of the Act as including not only marked, but also unmarked crosswalks. 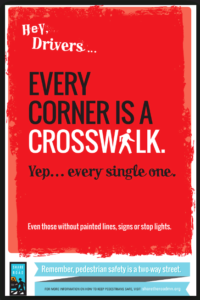 What is an unmarked crosswalk? Roughly put, it is the area of an intersection extending from one corner to another (not diagonal!). 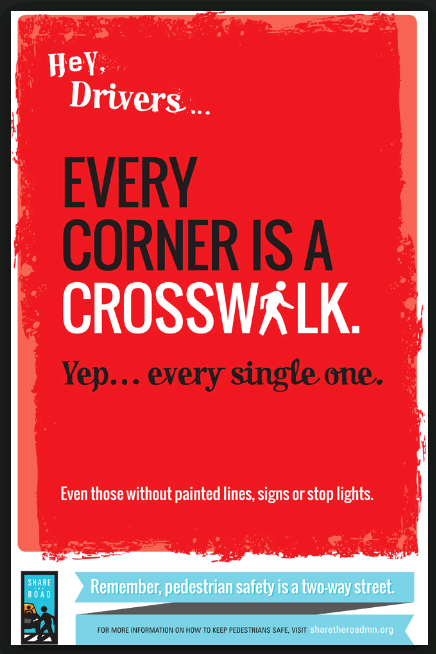 Yes, every corner is a crosswalk, every one. I learned about this element of the law when I read the July 7, 2016, decision of Mr. Justice Pearlmen, cited as Olson v. Farran, 2016 BCSC 1255. Now that I know this element of the law, am I going to step out into unmarked crosswalks in as leisurely and entitled a manner as I wish, with the full confidence of having the “right of way”? Absolutely not. Please, please check in for part two of this topic, where I will review other things I learned from Mr. Justice Pearlman, particularly important legal obligations on pedestrians, even if they very clearly have the right of way.